« Why Isn’t This “Horse” Moving? 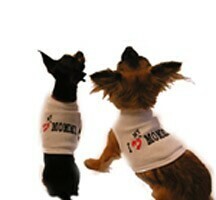 With Mother’s Day coming up this Sunday (don’t forget — you still have time to buy a card and a gift), you can treat a mother of a furbaby or even yourself to this pet t-shirt that says “I Love My Mommy”. What better way to say Happy Mother’s Day. This entry was posted on Tuesday, May 8th, 2007 at 3:57 am	and is filed under Cats, Dogs, National Dog, Cat & Pet Info, Products & Services for Cats & Dogs. You can follow any responses to this entry through the RSS 2.0 feed. Both comments and pings are currently closed.